The indicator is defined as the share of population living at risk-of-poverty. A person is defined as being in risk-of-poverty if his/her equivalized (by household size) income after social transfers is below 60 % of the corresponding national median. Although it is calculated per individual, its primary measurement unit is the household. The indicator At-risk-of-poverty-rate is included in the Laeken, the EU SDS and in the EU2020 Strategy indicators, with the objective being to lift out at least 20 Mio people from poverty by 2020. The urban map of people at risk of poverty shows similarly to the one for the regional analysis only values in relation to national average disposable income. As such it is not possible to use the map to study differences between countries, or in this case cities. Some interesting cross-country observations can however be made. 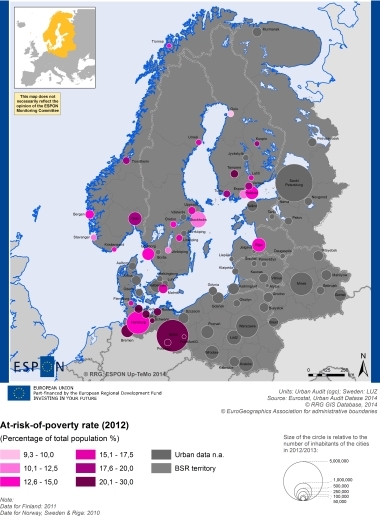 In Sweden for instance the share of the population at risk of poverty is lower in the capital city, as compared to secondary and tertiary cities. This is the opposite to many other countries such as Germany and Norway, where the cities of Berlin and Oslo show higher values then e.g. Hamburg, Bergen or Trondheim. The indicator is interesting since it might unfold a reality which is not too well known; in many cities of the BSR the at-risk-of-poverty rate is actually as high as 15-30 percent. And in countries like Norway, Finland and Germany the distribution, or spread, of inequalities between and within cities seem to be rather large.